Heaven was getting very crowded, so it was decided only to accept people who had really had a bad day on the day they died. 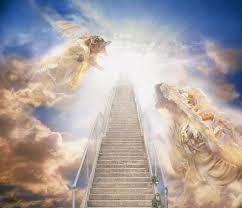 St Peter stood at the pearly gates and said to the first man, "Tell me about the day you died." The man replied, "Oh, it was awful. I was sure my wife was having an affair, so I came home early to catch her with him. I searched all over the apartment but couldn't find him anywhere. So I went out onto the balcony, and found this man hanging over the edge by his fingertips. I went inside, got a hammer, and started hitting his hands. He fell, but landed in some bushes. So, I got the refrigerator and pushed it over the balcony and it crushed him. However, the strain of the act gave me a heart attack, and I died." St Peter agreed that this was a pretty bad day, and since it was a crime of passion, he let the man in. He then asked the next man in line about the day he died. "Well, sir, it was terrible," replied the man. "I was doing aerobics on the balcony of my apartment when I twisted my ankle and slipped over the edge. I managed to grab the balcony of the apartment below, but then some maniac came out and started pounding my fingers with a hammer. I fell, landing luckily in some bushes, but, then the guy dropped a refrigerator on me!" St Peter chuckled and let him into heaven. He then turns to the third man in the line. "And how about you?" "OK, picture this," replies the man. "I'm naked, hiding inside a refrigerator ..."